iOS users are installing Apple's latest operating system at roughly the same pace iOS 8 was installed last year, according to multiple analytics companies that are tracking iOS 9 adoption rates. iOS 9 has now been available for download for just over 24 hours. Mixpanel's live iOS 9 tracking site suggests iOS 9 is now installed on approximately 12.60 percent of devices, which is in line with iOS 8 adoption rates in 2014. 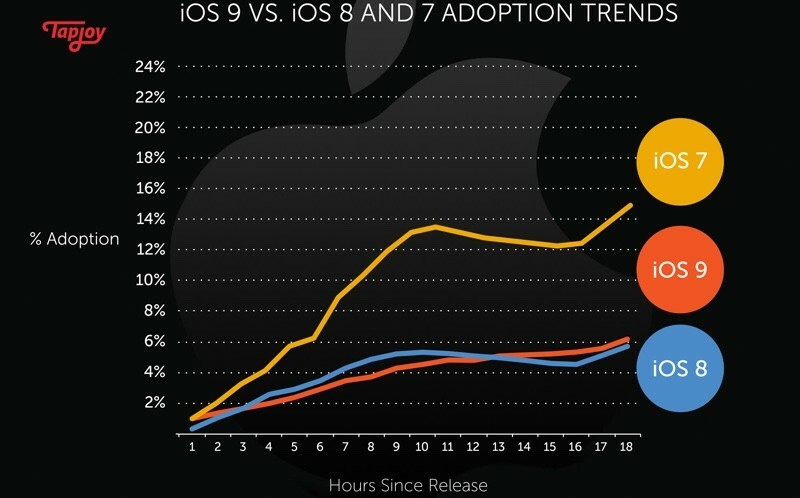 "iOS 9 has received 12% adoption in the last 24 hours and is being adopted similar to iOS 8 last year. This kind of adoption took Android's latest operating system, Lollipop, in comparison 5 months to achieve. One huge advantage Apple got right this year over last year was that the update is much smaller than last year (3.5x smaller) < Apple has empathy for its users who have nearly maxed out the space on their phones. However, one issue for it being substantially slow compared to iOS 7 is that servers are having trouble keeping up right now as people update." Because each analytics site tracks a different selection of iOS users based on app installs, iOS 9 installation numbers vary quite a bit across platforms. All of the sites tracking iOS 9 adoption agree that it is on pace with adoption numbers seen after iOS 8 was released last year, however. Tapjoy is seeing adoption rates spanning from 4 percent to 7 percent, based on device, while Fiksu is seeing 6 percent of its users running iOS 9. According to GoSquared, iOS 9 users now represent 12 percent of total iOS traffic, a number that's on par with both Mixpanel's count and an 11.84 percent measurement from analytics company Paddle. Two years ago, iOS 7 saw much quicker adoption rates than we're seeing with iOS 9, but that is not surprising as iOS 7 marked the last major design update to the operating system. iOS 8 and iOS 9 brought many new features, but few visual changes. What is surprising is that iOS 9 adoption is not outpacing iOS 8 adoption because iOS 9 has a much smaller installation size. While iOS 8 required 4.58 GB to install, iOS 9 only requires 1.3 GB, making it much more accessible to users who have little space open on their devices. I am still honored to be running iOS 6.1.4 on my iPhone 5; enjoying fluidity, smoothness, and a classic look. Most people I know are waiting until the weekend because they are phones they use for work. I expect this number to grow a lot by Monday. I updated the moment it was released and it's been running great so far. Easily explained because of people's horrific upgrade experiences with iOS8. That screw-up is going to take a long time to forget. This is the first time I've actually passed on updating my iOS on all my devices. I learned my lesson last time. I won't touch iOS 9 until I get my iPhone 6s. I plan to leave all my other devices on 8.4.1until 9.1 comes out or I hear improvements. Hm... so you're tell us that Apple should cut off products early and not offer software upgrades. Ok. Advice taken. One iOS upgrade is fine, I mean, anything more then that is just going to cause problems. Everyone should be updating every other year, anyway. It is DECREED by or dear leader Tim Cook. Or get an Android phone so you can be certain that you'll be stuck with whatever version of the OS it originally came with. After the slightly bumpy iOS 8 release, this is surprising. There isn't much reason to upgrade to iOS 9 if your device is jailbroken. There isn't much reason to Jailbreak if you're on iOS 9. There's a few ways to read that second graph. Here's mine based on my personal experience: the iOS 7 update was so painful that I am much more cautious to read others' experiences now before upgrading. That release greatly reduced my iPhone 4S performance, and I ended up not appreciating the UI changes either. iOS 9 looks to be a good update from what I've read so far, but I'll probably wait a few more days. 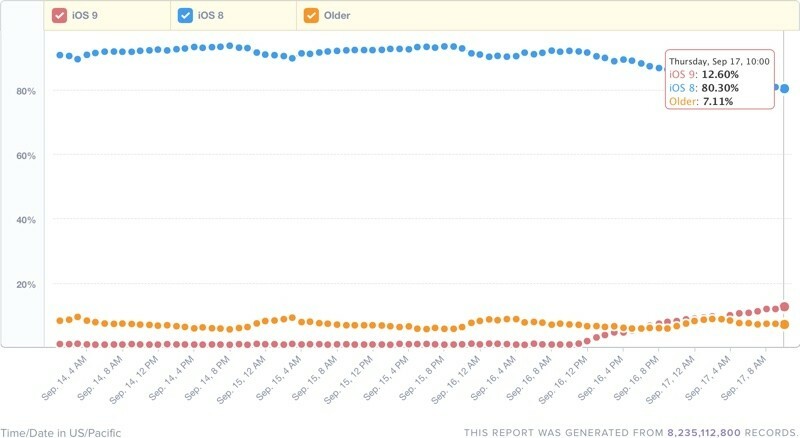 Why did iOS 7 have such a dramatic adoption rate? Because it was a complete makeover. It was more exciting. Honestly, iOS 9 should be mores since it's a stability upgrade.